The Kepler team recently announced the detection of five stars, each with multiple transiting planets (Steffen et al, 2010). 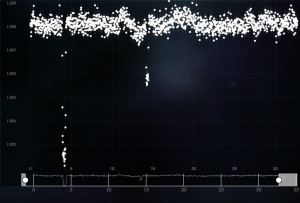 The left Figure below shows the Quarter 1 (Q1) light curve for the star SPH10102031 (Kepler ID 10723750) with two transit dips from two different planets. The transits do not repeat because the orbital periods are longer than the time baseline. The first transit dip is from a planet that is about the size of Jupiter. To highlight the typical boxy shape of a planet transit curve, we have zoomed in on the second transit event in the Figure below and on the right. The depth of the transit is about 0.25% and given the assumed radius of the star, the planet radius is about 7.6 times the radius of the Earth (larger than Neptune, but smaller than Jupiter). Light curves for two other stars in the Steffen et al 2010 paper are shown below. The Figure on the left is the Q1 light curve for SPH10120491 (Kepler ID 8394721). 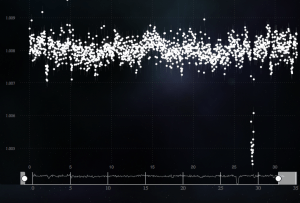 This light curve contains transit dips from three different planets! One of these is very obvious and is caused by a planet that is 6.5 times the radius of Earth that only transits once during the 35-day light curve. However, there are two other transiting planets that are harder to see with radii of just a few times that of the Earth. One of these planets transits every 13.5 days and the other transits every 27.4 days. 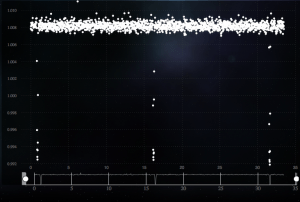 The Figure above and to the right shows the light curve for SPH10017624 (Kepler 5972334). There are three transit dips from a Jupiter-sized planet that orbits every 15.4 days. In this Figure, it is virtually impossible to see the second planet, which has a radius just twice that of the Earth and transits every 2.4 days. To get a better look and some practice (you won’t be able to save these), pull up these amazing light curves and use the zoom tool to identify the transits. Perfect examples. Most interesting is SPH10017624. I spent like 2 hours trying to find the transits. Thanks for the explanations. Hmm, sorry to sound a little ungrateful, but if I’m quite honest, I have a bit of an issue with the fact that these are all textbook examples… I’m relatively confident that I’d be able to spot transits like that (i.e. ones with eight or more dots and little to no background noise) even without the zooming tool. What I still struggle with, though, is identifying the less pronounced transits, especially with stars which have more background noise – well, I should say ‘what I THINK are less pronounced transits’, because I’m often quite doubtful whether I’m not just imagining them (and in such cases, the zooming tool is often not much help). So what I’d be most interested in seeing here would be a few examples of less obvious transits, with fewer dots and more background noise, to give me a better sense of what I’m looking for there. mutabilitie has a point. If we should also be looking for something less obvious please put up an example here, on facebook so I will see it. As of now, I am just going to look for examples such as you have posted above. Hello, I agree with Mutabilitie and TLSanders. Do you have “not so obvious” example to show ? I don’t think your efforts are useless. SETIlive (http://www.setilive.org) uses simulations as well, and some of their simulations are also so faint they get lost in the noise. A lot of poeple were confused and discouraged until the SETIlive team updated the message shown when there was a simulation to let people know some signals are too faint to see. Maybe make an option during login whether you like to see simulated data or not. A lot has been explained in blogs recently and after some 3000 stars you really get the hang of it. In fact because of the nature of the kepler experiment and the fact that we need at least 3 transits for maybe slow orbiting planets we might consider that we have no idea where to really look for other than anomalies in light curves that might contains valuable transit data that was not spotted by the official kepler team. What I would suggest is that if you like to work with simulated data than just input the actual (not public data) kepler transit candidates and let us capture than in stead of making this easy to find imho not real world simulations. I agree with tjapko, at least mostly. There is a definite threshold, which I think is around 3000 planets, after which your ability to pick out transits becomes exponentially improved. I think this is mainly because you’ve seen a good sample of all the false positives (which are many and varied) by that time. I’ve often wished I could go back and re-do my first 1000 or so. Thanks for your comments and your work sieving the light curves. We’re reluctant to over-train you, in part because then you might function as our computer algorithms and we’re hoping that you will think outside the algorithm! There are three key issues that have been raised in your comments: (1) the examples given seem textbook, and therefore too easy (2) how can you recognize more subtle transits. The really small transits are impossible to see and it’s discouraging, and (3) can the synthetic light curves be optionally turned off? 1. Regarding the first point, these examples were pulled from a publication and are actually unusual because there is more than one planet transiting (and therefore they would have been a bit confusing to me). As the synthetic curves (now properly integrated into the site) show, the very shallow transits may be impossible to find by eye. 2. If you discovered the 2.4 day transit around SPH10017624 (Kepler 5972334) above, then you’re amazing! We’ll be providing you with another analysis tool soon (periodograms) when we upgrade the site. You’ll gain a whole new appreciation for Fourier Transforms when you see this tool! Meanwhile, the best training is going to be the synthetic (fake) transit events that have been injected into real light curves. 3. The synthetic light curves are an important part of the experiment. We’ve injected fake transits with a range of planet radii and orbital periods to assess the fraction of missed planets. If users flag 100% of the Jupiter-sized planets with orbital periods shorter than 30 days, but only 50% of the Neptune-size planets with orbital periods shorter than 30 days, then we know that the number of transiting Neptunes in the real light curves is a factor of two larger than what has been flagged. Likewise, we have corrections for other planet radii and other orbital period ranges. This provides a powerful statement about the fraction of transiting planets that could only be made with the Planet Hunter collective. Where you say “One of these planets transits every 13.5 days and the other transits every 27.4 days.”, should this be “1.35 days” and “2.74 days”? I seem to be able to see dips with these periods, and also can’t see how you’d detect (especially visually) small dips with such long periods in the normal 30-day period. Sorry for erratic quotation marks there. I put them in, in the appropriate places but somehow they got lost as displayed afterwards. Problem with text input? curve examination and comparison of your light curves with those in the paper (where all transits are indicated). You’ll see more examples soon. I’ve passed a dozen transit candidates that PlanetHunters have identified to Dr. Batalha on the Kepler team. There are five viable transiting planet candidates and we’re just getting started! Fantastic work! We hope to have the candidates page updated by Jan 10 and will include comments that the Kepler team has kindly provided. As the candidate list grows, you’ll have more examples of what good candidates look like. So, where exactly is that super earth with 2.4 period in the last one? I can’t see that 2.4-d period! What the science team would do is to run a periodogram analysis (a tool we’re hoping to make available to PlanetHunters) and then phase-fold the data at the period of 2.4-days. Then, we’d see all of the data overlaid on one cycle and it would build up the signal. We’re hoping to have this for v2! I like the link to the collections that derek n posted on january 4.thank you. very helpful. I hope it gets updated as you get more known transits. Anyone still looking for the 2.4-day-period superearth around SPH10017624 (Kepler 5972334) – the 6th pic above ? Here are the transits – found by eye using the PH interface. 8.2 / 10.65 / 13.05-13.25 !!! +plus flare? Thanks a lot I added you and and zooniverse also on twitter. I made some mistakes for sure in my first 30 observations but I know I will find something alone or with the help of others or make new discoveries. Very very nice projects these, indeed. I;m so excited about this project but I can’t for the life of me work out what I’m looking for.Are the vertically arranged white dots the star at 35 minute intervals?Working horizontally are we moving 24 hours at a time?Are the “white dots” photographic images or merely representations of data? I don’t have a science/astronomy background(probably don’t need to say so)and am eager but very confused. I feel the same as the above two people. It was suggested on Stargazers that a six year old could help with this but I’m a lot older and certainly not dumb but I am having trouble understanding just what I’m looking for. It seems the site is only for those with knowledge of the subject. This is disappointing as I do have an interest. As Tirzah says it is not well explained at all. Thanks Victoria. I hope some of you commenting have had a chance to play with the site itself at planethunters.org – and to try looking at the site guide at http://planethunters.org/site_guide if you’re still having trouble. Each dot is a measurement of a stars brightness – the higher the dot, the brighter the star was at that point. You’re looking for sudden drops in brightness like those in the picture above. Hi, I think as a project this is wonderful and it is great that members of the public can get involved and thanks to the power of TV you picked me up and many more I am sure. I have just passed my 1000 observations and still don’t have a clue if I am helping very much. Most of the light curves are quite noisy and appear to have a large range of intensity. The guide has been useful to get started, but where can I find out a little more to help me improve my accuracy. The random test examples are great,but could you not put together a test page with 20 or 30 on that we can test ourselves on and then have you show us where the transit is. It would be great to take the test every once in a while to help calibrate my observations. It links to light curves for the Kepler planet candidates – you can take a look and see if you identify any of the transits in the different candidates. Hi I with my granddaughter have only just signed on and we are having difficulty understanding what we are looking for. Even watching the guides. The guide we watched explains that there are no transients visible but then explains how to mark a transient with the boxes. This does not show what we are looking for? We have marked a few samples but I feel it was a waste of time. I think the idea of using the public on projects like this is a great idea but only if what we do is viable and not a waste of time. I have had to learn not to over-analyze. You’ll begin to see patterns that aren’t there. I am a grad student at Univ of Houston. I joined planethunters after watching Lucianne Walkowicz’s talk on TED. I have a question here. 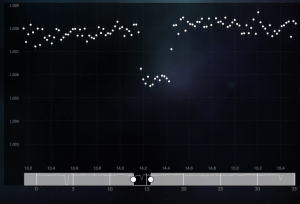 How can you classify a star in the beginning only by looking at the data from the fist 30 days or so? One might not find any transit points and classify it incorrectly. Also, for planets who have periodicity more than the time for which the data has been recorded, then there is very little possibility of recognizing a transit data for it. Maybe it is just me, but I find it easier if I rotate the screen 180 degrees and look for an anomalous rise in stellar darkness rather than a brightening. I know they are the same thing numerically, but visually they are different to me. What would help is a lot more observations per star so establishing a normalized range of brightness would be more secure. How long will Kepler provide data? I am concerned that I will be able to see transits that your software would not spot. I have considerable experience analysing wave motion in high sea states. A decent Fast Fourier Transform reliably identified subtle wave components that I could never have picked up with a Mk 1 eyeball. I am truly happy to read this website posts which consists of tons of valuable facts, thanks for providing these kinds of information.